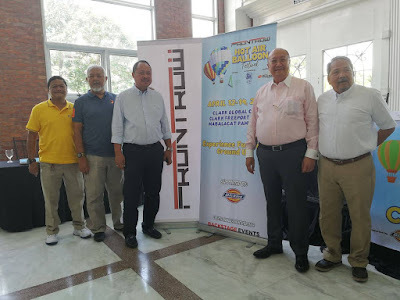 (L-R) Serafin Tolentino, Safety Officer; Noel Castro, Consultant; Wilfredo Placino, Vice Chairman and President of Global Gateway Development Corp.; Bernie Bituin, Launch Master; and Joel Santos, Balloon Crew Chief. The mere mention of the Hot Air Balloon Festival at Clark Global City brings to mind the eye-popping visual of larger-than-life gathering of hot air balloons in all shapes and sizes from all over the world. The sky is dotted with giant animals, happy faces, and other improbable flying objects alongside the classic striped hot air balloons. That moment when they all rise up to the sky in the sunrise is one of the most IG-worthy moments we’ll see all year. 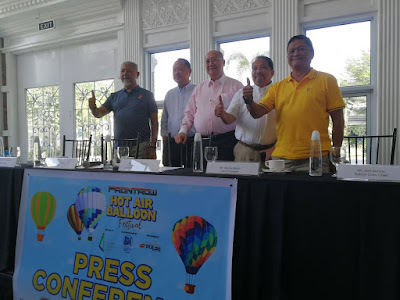 This year’s Frontrow International Hot Air Balloon Festival on April 12 to 14 promises to be even bigger, bolder, busier, and better. The event boasts of a bigger and more accessible venue at Clark Global City—a thriving hub of industry and commerce that you can literally get to by air, land, and sea. This event brings people from all walks of life together. Around 50,000 to 70,000 people are expected to come that weekend, from families with young children, teens, students,tourists, to various groups such as motoring clubs, foodies and travel enthusiasts, even real estate groups, and government officials. A jam-packed weekend There will be balloon rides, of course, but the festival also has activities on the ground while people wait for their turn on a balloon, and for those who prefer to stay earthbound. There are over a hundred of food and shopping choices. There are fun activities for kids and families such as inflatable attractions and slides, shows for kids with their favorite cartoon characters. The country’s hottest music acts, along with the best of Pampanga’s bands will take the stage every night over the weekend with the country’s hottest acts—Slapshock on Friday, Kamikazee on Saturday and Ely Buendia,Hale, and Unique Salonga on Sunday. Car and motorsport enthusiasts will gather together for several major events that include the National Drift Championship, Slalom Racing, Philippine Auto Cross Championship Series, Philippine Rally Cross Series and Motorcycle Stunt Show. We’ll also be witnessing groups dancing and grooving to the beat this summer as 20 dance groups from different cities compete on April 13, 2019. The Frontrow International Hot Air Balloon Festival will be a feast for all the senses and a weekend that you wouldn’t want to miss. The Frontrow International Hot Air Balloon Festival hosted by Clark Global City, co-presented by SM City Clark, powered by Phoenix Pulse Technology, supported by Dickies and The Medical City Clark. For more information on the event, follow on (Facebook, Twitter and IG) @clarkglobalcityhabf.